Oh dear. 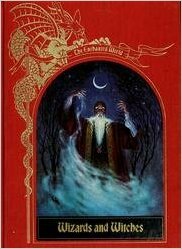 Another review of a collection of retold tales about wizards and witches. We’ve seen far too many of these already, haven’t we? Actually, no — this book is different! Yes, it’s a collection of tales about wizards and witches, retold and rewritten, but this book manages to avoid falling into the cliche of “old, retold legends” that many tomes like this fall prey to. First off, the book is simply the highest quality collection I’ve come across. Others are good, but this one is the best. The book is written in the professional, eloquent style of other Time-Life Books, which brings these stories to the reader in a crisp, accessible manner that isn’t burdened down with misuse of archaic slang or overuse of “thee” and “thou”. The stories unfold in such a fluid and intelligent manner the reader can feel that the tales are being written up by someone very learned in the craft, a scholar gifted not only in research but also in storytelling itself. The book — with large, full-color pages — is also beautifully bound and illustrated, which makes it doubly delicious to enjoy. (I would be proud to be seen reading this in public!) The binding itself is a strong red, with gold lettering and golden dragons imprinted upon it, and the glossy images inside are stunning.